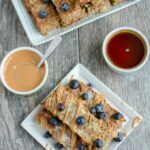 These Banana Baked Oatmeal French Toast Sticks are a healthy, kid-friendly breakfast recipe. They can even be made ahead of time, stored in the freezer and reheated in the microwave! To make the baked oatmeal, combine oats, 1.5 cups milk, 1 egg, banana, cinnamon, vanilla and peanut butter, if using, in a large bowl and mix well. Pour into a 9×9 pan lined with parchment paper. Bake at 375 for 25 minutes or until set. Let cool completely, then cut into 12 sticks. Mix 2 eggs and 1/2 cup milk in a pie tin or shallow dish. Dip each stick in egg mixture and cook on a griddle as you would french toast. To freeze, cool completely, store in a ziploc bag, microwave up to 4 sticks at a time on a plate for 30 seconds, flip over and microwave 30 seconds more.